In this article, you will find the drone laws in Papua New Guinea. To my knowledge, there are currently only rules for private drones (model pilots) in Papua New Guinea. I do not know anything about regulations for commercial drone users. The following rules apply in Papua New Guinea. Maximum Altitude: From an altitude of more than 120 meters (400 feet), you must report your planned maneuver to the NOTAM office at least 24 hours before the flight with details of the aircraft, you as a person including contact information and altitude. Maximum horizontal distance and FPV: Drone flights must always take place within sight. Compulsory insurance: To my knowledge, there is no mandatory insurance for drones in Papua New Guinea. Nevertheless, you should take out aviation liability insurance. Maximum take-off weight (MTOW): The weight specifications for model airplanes is between 100 grams and 25 kilograms. Distance to airports: To reach airports in Papua New Guinea, you must be 4 kilometers away. Operating Hours: Drone flights in the open air are not allowed at night. Special legislation: Flights are only allowed if the visibility is more than 8 kilometers. Regulations for commercial pilots: Unfortunately no information available yet. 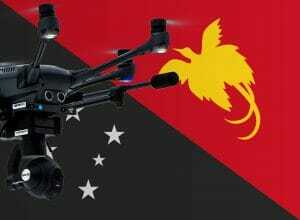 We have researched the listed drone regulations for Papua New Guinea to the best of our knowledge. We cannot guarantee the correctness of the information. If you want to be on the safe side, contact the competent aviation authority. Alternatively, you can also ask the embassy in your country for further information about the regulations. Please leave us a comment when you receive news and/or gain experience with your copter in Papua New Guinea!